According to certain experts, this dog was introduced in Peru during the Chinese immigration, soon after the promulgation of the law abolishing the slavery of the blacks by the president of Peru, Don Ramón Castilla. On the other hand, other researchers suppose that this dog comes from the African continent through the intermediary of nomads who arrived in America accompanied by their hairless dogs. Another possible explanation is that the presence of this dog would be due to the migration of men and their dogs from Asia to America through the Bering Strait. However, next to all these suppositions, there are certain proofs such as the representations which appear on ceramics of different pre-Inca civilizations (Vicus, Mochica, Chancay, Chancay, under Tiahuanacoid influence, Chimu); in many cases the hairless dog has replaced the puma, the snake or the falcon; this in particular and in a more evident way in the Chancay culture. As we can gather from the reproductions, the hairless dog appears during the pre-Inca archeological periods, i.e. between the years 300 BC and the years 1400 AD. 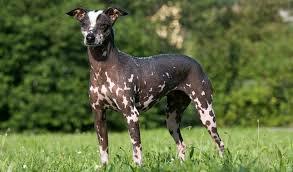 The Peruvian Inca Orchid/ Peruvian Hairless Dog is a sight hound. Going by his general conformation, it is an elegant and slim dog, whose aspect expresses speed, strength and harmony without ever appearing coarse. The fundamental characteristic of the breed is the absence of hair all over the body in the hairless variety. The minority are the coated examples which are an important part of this breed’s genetic makeup. Another particular feature is that the dentition is nearly always incomplete hairless examples. Important Proportions: The ratio between the height at the withers and the length of the body is 1:1; the body of the females can be slightly longer than that of the males. Behavior/Temperament: Noble and affectionate at home with those close to him, at the same time lively and alert; he is wary and a good guard in presence of strangers. Of lupoid conformation. Cranial Region: Skull - Mesocephalic. Orthoid, i.e. the upper axis of the skull and muzzle are parallel; a slight divergence is accepted. Seen from above, the skull is broad and the head tapers toward the nose. The superciliary arches are moderately developed. The occipital crest is hardly marked. Stop - Cranial-facial depression barely marked (approximately 140 degrees). Facial Region: Nose - The color of the nose must be in harmony with the different colors of the skin. Muzzle - Seen in profile, the nasal bridge is straight. Lips - Moderately tight to the gums. Jaws/Teeth - Scissor bite. Incomplete dentition in the hairless variety is normal. The lower jaw is only slightly developed. The coated variety should have full dentition. Cheeks - Normally developed. Eyes - Alert and intelligent expression. The eyes must be of average dimensions, slightly almond shaped, neither deep-set nor prominent, normally and regularly placed, i.e. neither too close together nor too wide apart. The color can vary from black, going through all shades of brown up to yellow, in harmony with the skin color. In any case, both eyes must be of the same color. The color of the eye rims may go from black to pink in subjects with light colored face. The light pink colors are permitted but not sought after. Ears - The ears must be pricked when the dog is attentive, whereas at rest, they are laid towards the back. The ears are of medium length; broad at the base, tapering progressively towards their tip, ending almost pointed. The ear set starts on the upper part of the skull to end laterally and obliquely. In erect position, the axes of the ears form a variable angle near 90 degrees. In the coated variety the ears are semi-prick when the dog is attentive, and can be laid back when relaxed. Upper line - Curved (convex). Length - Approximately the same length as the head. Shape - Near to a truncated cone shape, supple, with good musculature. Skin - Fine, smooth and elastic. Really close to the subcutaneous tissues. No dewlap. Mesomorph. Topline - Straight, although certain subjects show a dorsal-lumbar convexity which disappears at croup level. Withers - Barely accentuated. Back - Topline straight, with well developed back muscles often forming all along the back a muscular bi-convexity which extends to the lumbar region. Lumbar region - Strong and well muscled. Its length reaches approximately one-fifth of the height at the withers. Croup - Its upper profile is slightly convex. Its slant compared with the horizontal is about 40 degrees. Its solid and well muscled conformation assures a good impulsion. Chest - Seen from the front, the chest must have a good amplitude, but without excess; comes down almost to the elbow. The ribs must be lightly sprung, never flat. The girth of the chest, measured behind the elbows, must exceed by about 18 percent the height at the withers. Underline and Belly - The lower profile draws an elegant and well marked line which goes from the lower part of the chest and rises along the belly which must be well tucked up, but without excess. The tail is set on low. Of good thickness at its root, it tapers towards its tip. When excited, the dog can carry the tail raised in a round curve above the backline, but never as curved as being rolled up. At rest, it hangs with a slight upward hook at the tip. Sometimes carried tucked in towards the abdomen. In length it almost reaches the hock. The tail must not be docked. Well united with the body. Seen from the front, they are perfectly vertical and the elbows are not turned out. The angle at the shoulders joint varies between 100 and 120 degrees. Seen in profile, the angle formed by the pastern and the vertical will be from 15 to 20 degrees. Forefeet - They are semi-long and look like hare-feet. The pads are strong and heat-resistant. The interdigital membranes are well developed. The black dogs have preferably black nails and the lighter dogs light nails. The muscles are rounded and elastic. The curve of the buttocks is well marked. The coxal-femoral angle varies between 120 and 130 degrees, and the femoral-tibial angle must be of 140 degrees. Seen from behind, the hindquarters must be vertical. Dewclaws must be eliminated. Hind feet - As the forefeet. Given the structure and angulations of the above mentioned quarters, these dogs move with a rather short step, but fast and at the same time quite soft and flexible. The skin must be smooth and elastic all over the body, but can form a few rounded almost concentric lines on the head and round the eyes and the cheeks. The hairless examples must have exposed skin in the place of the coat (hair). Short hair on the head and vestiges of hair on the lower tail and feet are acceptable. A few hairs may appear on the face and body. Shaving or any other form of hair removal is not permitted. In the coated variety the coat may be short or medium length with feathering present at the neck, ears and body. In the hairless variety the skin can be of any color and can either be uniform or with unpigmented areas. In the coated variety all colors are accepted. There are three sizes in the males and females. Small - from 9¾ to 15¾ inches (25 to 40 centimeters). Medium - from 15¾ to 19¾ inches (40 to 50 centimeters). Large - from 19¾ to 25¾ inches (50 to 65 centimeters). The weight is in relation to the size of the males and Page 3 of 3 females. Small - from 8½ to 17½ pounds (4 to 8 kilograms). Medium - from 17½ to 26½ pounds (8 to 12 kilograms). Large - from 26½ to 55 pounds (12 to 25 kilograms). Deviated jaw. Albinism. Aggressiveness. Presence of dewclaws on the hindquarters. Note of interest: It has been checked that the internal and external temperature of these dogs is exactly the same as that of other breeds. The absence of hair leads to an immediate and direct emanation of heat, different from the hairy subjects, where the heat filters through the coat (hair) by natural ventilation. Click Here to Learn about breeder background checks on Peruvian Inca Orchid breeders if you are looking for Peruvian Inca Orchid puppies for sale. Click Here to learn how ResearchBreeder.com can help you find healthy Peruvian Inca Orchid puppies for sale. Click Here to order a Breeder or Kennel Background Check on Peruvian Inca Orchid Breeders that may have Peruvian Inca Orchid puppies for sale. Click here to find the national breed club for Peruvian Inca Orchid puppies for sale. Click Here to purchase a list of approved ResearchBreeder.com Peruvian Inca Orchid Breeders who have Peruvian Inca Orchid puppies for sale.